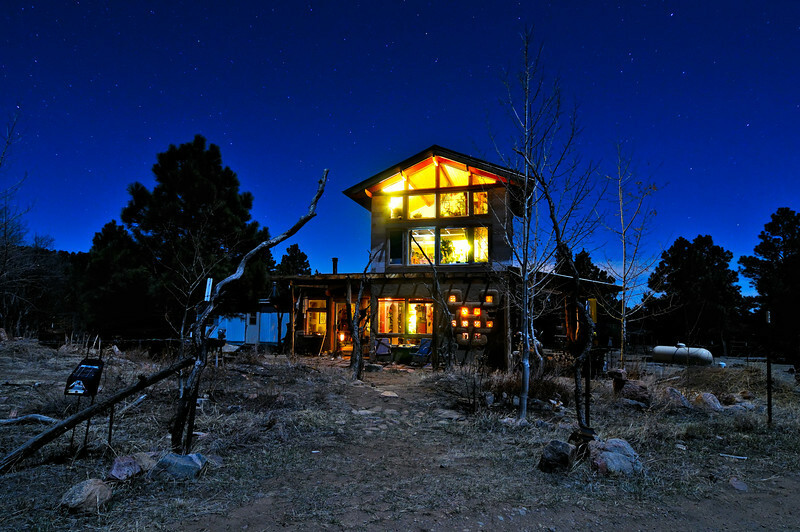 This beautiful exposé of sustainable home design is my sister's place near Florence, Colorado. Powered by solar energy, this house was planned by her architect partner and hand built as a labor of love. This is the same structure featured in my "Here on Earth" image previously posted (see comments). Image notes: My first night shot with my new Tokina 11-16 mm f/2.8. I have to say I've never seen a lens focus so far past the infinity mark. I'm hoping I don't have to return mine to get a decent copy (pixel peeping testing to ensue this week now that I've given it a run in real world shooting conditions). That said having an UWA again is a major treat! Not an hdr, but I did blend a darker version for toning down the window brightness. The primary light source is a near full moon.